The high volume of documents currently produced by UN organisations as well as the amount of non-UN documents that have to be processed is posing a significant challenge to the UN system. Effective and efficient information management and accessibility is well beyond the “human processing” capabilities of UN organisations. To address these challenges, UN organisations must move from the paper paradigm, where documents are “designed for humans to read, not for computer programs to manipulate meaningfully”, to a new form of content “meaningful to computers [that] will unleash a revolution of new possibilities” (Sir Tim Berners-Lee, 2001). The process of turning documents into “machine-readable” and identifying the information and knowledge to make it possible to deliver innovative information services, has been both highly specialised and labour intensive. UN organisations are not in position to make available the human and financial resources that would be required to produce machine-readable documents in the “traditional” labour intensive way. In any case, due to the rapid growth of documents to be processed, the “manual way” would not be in any case a sustainable approach for legacy documentation. The only viable option is to exploit natural language processing technologies with the proper level of maturity that can be used to semantically analyse and process information and data contained in textual documents. The use of machine learning and artificial intelligence has the potential to greatly reduce the cost of carrying out structural and semantic analysis and effectively deal with the considerable volume of information that need to be processed daily. To enable this transition, HLCM has been promoting a system-wide approach in the critical domain of information management. In March 2017, HLCM approved the UN Semantic Interoperability Framework (UNSIF), composed of Akoma Ntoso for the United Nations System (AKN4UN) and the United Nations System Documentation Ontology (UNDO) as the first building blocks of the seamless machine readability of textual documents across the UN system. UNSIF is meant to create a UN-wide ecosystem of machine-readable documents that will foster collaboration and reduce costs in information management by transforming machine-unreadable documents into a web of information that can be processed by computers to deliver significant benefits in terms of governance, accountability and transparency. A seamless UN-wide ecosystem of machine-readable documents and data will prove to be a considerable asset for the implementation of the 2030 Agenda for Sustainable Development, which requires a robust review mechanism and a solid framework for evidence-based policies and accountability. This challenge is focused on automatic generation of machine-readable documents with rich semantic mark-up by making use of open source natural language processing and text mining applications to carry out automatic entity extraction and content analysis. These semantically enhanced documents will be ideally suited to effectively support smart decision tracking and document retrieval tools as well as query the advanced metadata and descriptions to create innovative information services for end users. Specifically, this challenge aims to pilot open source tools carrying out automatic entity extraction and content analysis, showcasing the semiautomatic generation of machine-readable documents with rich semantic mark-up up. The purpose of these enhanced documents is to support decision tracking and document retrieval thanks to semantics-driven machinery able to query the advanced metadata and exploit its descriptions to create additional decision management systems for the end users. 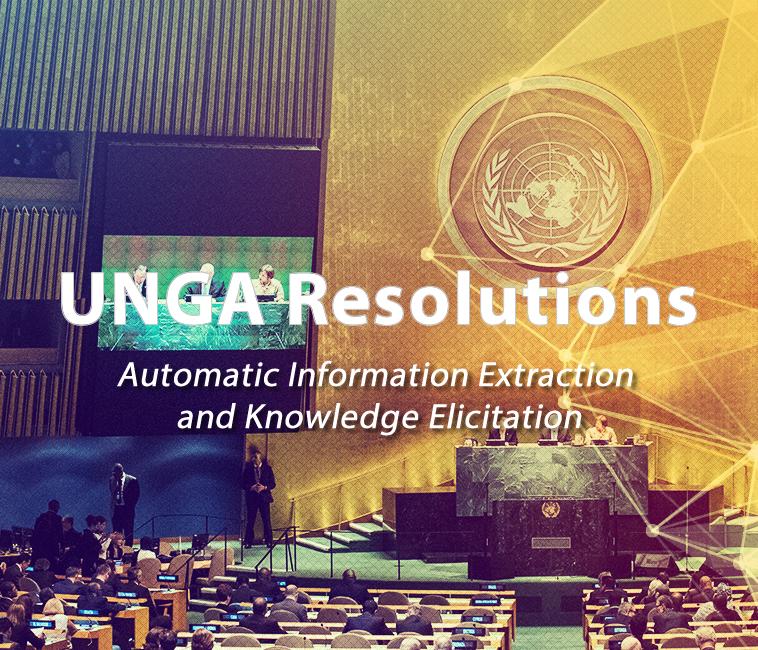 The challenge is focused on the analysis and categorization of information contained in UN General Assembly (UNGA) resolutions. General statements on the topic, its significance and its impact. The operative paragraphs identify the actions or recommendations made in a resolution. Each operative clause begins with a verb (or phrase) in the present indicative tense (called an operative phrase) and ends with a semicolon. Operative paragraphs are organised in a logical progression, each containing a single idea or proposal, and are always numbered, apart from the case where there is only one operative paragraph. If a paragraph requires further explanation, bulleted lists set off by letters or roman numerals can also be used. After the last operative clause, the resolution ends in a period. Entities: e.g. persons, roles, countries, places, deadlines, references to concepts relevant to the “United Nations Bibliographic Information System” (UNBIS) or “Sustainable Development Goals Interface Ontology” (SDGIO) of UN Environment. Preambular paragraphs: references, citations, mentions etc. Operative paragraphs: identify who does invite/ask/require/demand what (actions, requests, recommendations, etc.) and organize into machine-understandable data structures. One repository containing source code, data, configuration files and other resources, together with core documentation necessary for building/running the system. The repositories should be under any open-source license that allows for free reuse of the code, allowing commercial use but not the production of closed-source systems that are a derivation of the original one. The use of existing free/open source libraries and code is encouraged, as long as the participants comply with the terms of the licences. Files that are not covered by these licences (such as text files and images) should be published under the Creative Commons Attribution 4.0 International or CC0, as authors see fit. The repository should include a dataset with the output of the automatic processing performed on the resolutions dataset. A document that describes the current state of the tool and the work needed to reach a potential release state. Throughout all phases below, individual and teams are encouraged to interact with the core team to discuss the requirements for this project. Ideas & Teams Formation. Deadline: 8 February 2019 - Using the Unite Ideas website, project leaders can submit their ideas for architectures and approach while volunteers list their skills and offer to join their team(s) of choice. You don’t have to be in a team, you can also work independently. Collaboration and implementation of Proposal. Deadline: 26 April 2019 - Participants should provide a document describing the initial proposal for completing this task, including the technologies, methodologies, milestones and approaches that will be taken. Review of Proposals: Deadline: 24 May 2019 - The review panel will provide feedback on the proposal and decide which one will qualify for the Development Phase. As previously stated in the Expected outcomes section, all the inputs and outputs of this project must be covered by the GNU GPL v3.0 Affero, GNU GPL v3.0, Creative Commons Attribution 4.0 International or CC0 licences, depending on the nature of the resource, unless the participants justify the use of other free/open source/copyleft licence. You will be asked to accept terms and conditions prior to submitting any content. Evaluation of the quality of marked-up documents of the AKN4UN tags compared with the expected outputs. Usability: the ease of use and user-friendliness of the tools. Accuracy: the degree the tagging and the information extraction of the tool are correct. Insights: the degree the results and visualization by the tool are useful to detect displacement events and the corresponding displacement figures and presented in a creative manner. Modularity: the ease of customization enabled by the solution. Maintainability: the grade of the engineering practices used when developing the tool. Elegance: the elegance of the code and the quality of documentation provided. Documentation: the quality of the documentation provided alongside with the code. Be offered the opportunity to participate in a possible further development of the submitted code. This challenge is open to the general public. Public, private, and academic organizations are also invited to take part. Only original, open source work will be accepted. It is acceptable that your solution uses other existing open source libraries. There are no limitations on the number of submissions per participant/participating team. The participants are required to agree on the terms and conditions. UN General Assembly resolutions in MS Word format. Click on "Post Idea", register to the Unite Ideas website, and then post your draft or even just the title of your preliminary idea. You will be able to edit your idea until the last day of the submission phase.